That I opted for the Creole Slammer at Slim Goodies over the Jewish Coonass is to say I chose hash browns over potato latkes. 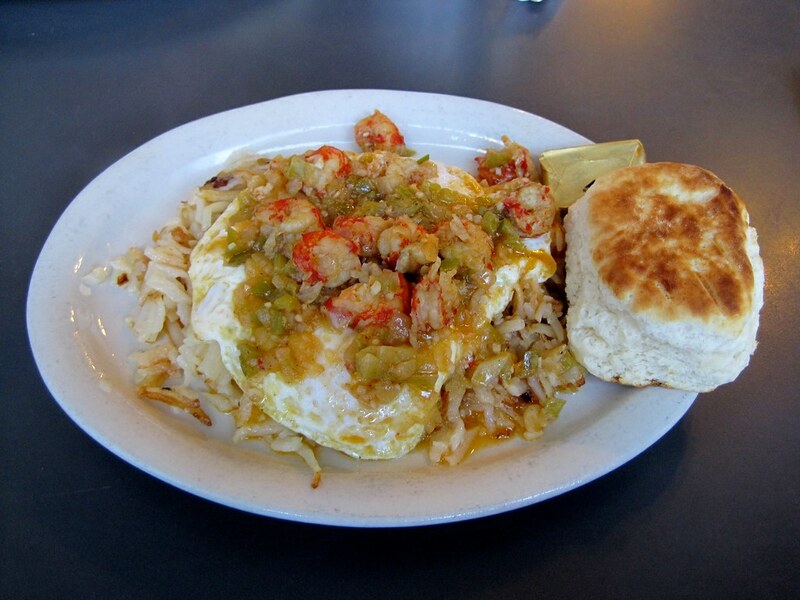 The dish, pictured, above was topped with over-easy eggs and bathed in crawfish etouffee. As I was unfamiliar with the term “coonass,” and since it sounds incredibly derogatory I investigated. Despite its disputed origin, the term it isn’t so bad when Cajuns say it to each other and its use may have led to the Cajun people being recognized as a distinct ethnic group. The biscuit was such a welcome addition, I ordered another. If I ate this way every day, I would certainly die. But then again, I will certainly die some day, so I should enjoy these breakfasts while I can, no? After riding bikes around town for most of the afternoon Sunday, this certainly broke my fast like a sledgehammer. 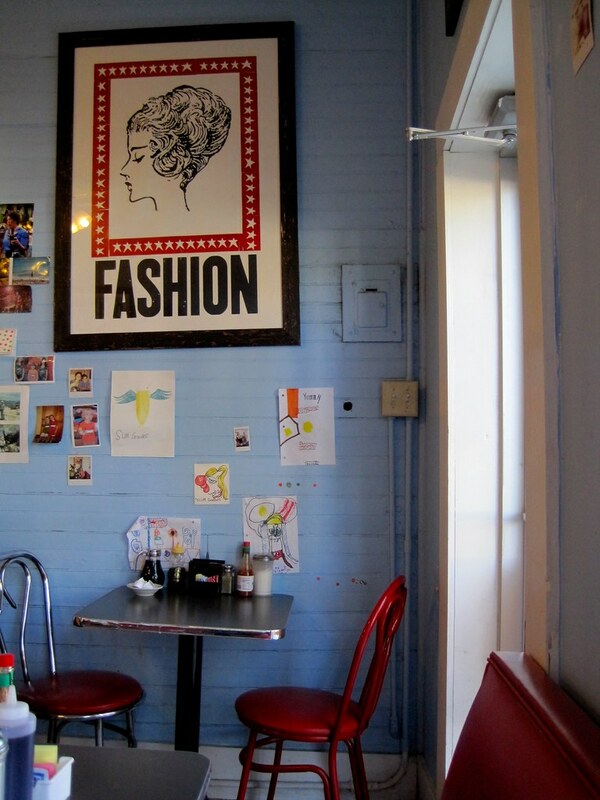 Slim Goodies’ decor endeared me to them just as much as the food. Gorgeous letterpress posters from some of my favorite shops fill the walls, including Yee Haw Industries (Knoxville, Tn.) and probably some from Hatch Show Print (Nashville), and Standard Deluxe (Waverly, Al.). 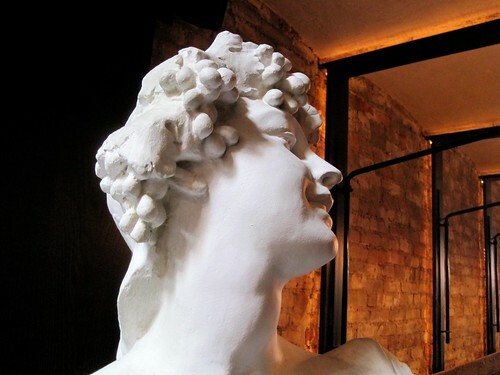 Check out the back patio for some wandering chickens, shaded tables, and creepy statues. Skip produces The Gourmetro. Check out his published works on Aisle 9, and talk with him on Twitter. After landing a bit behind schedule at Louis Armstrong International Airport in New Orleans, Elisa and I got a quick pint-and-slice at New York Pizza. With an Abita Amber and Lazy Magnolia Jefferson Stout, we headed downtown to the New Orleans On Tap beer festival. 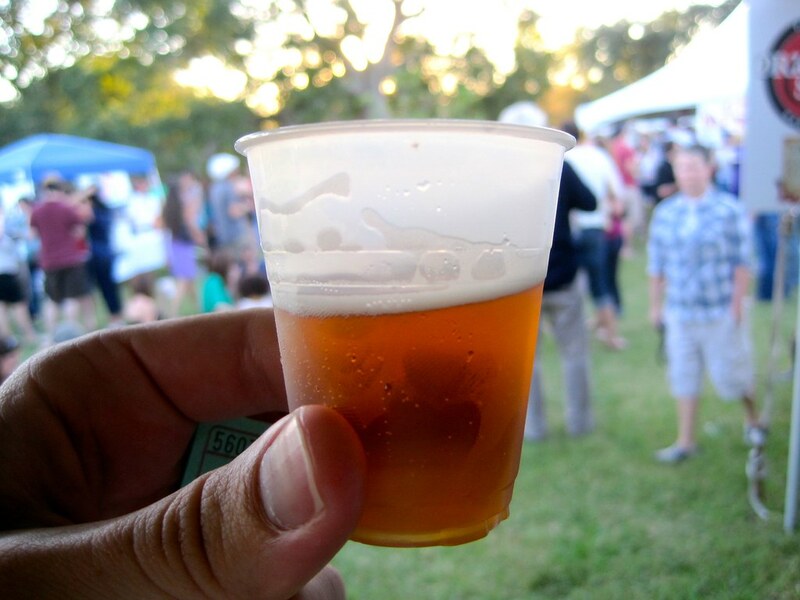 The most interesting taste: Bayou Teche Biere LA 31 Boucanee. This cherry-wood smoked wheat beer tasted like smoked gouda, and is certainly not a session beer. In fact, I would probably only drink this with food. Salty, smokey, cheesy, delicious food. That’s it for this mini-post, folks. I’ll be in town all week writing and shooting. I’d nearly forgotten the art of brunch: delicious food with a couple of strong (yet appropriate) drinks to help facilitate the transition between Saturday night, Sunday afternoon, and the eventual return of the workweek. Coffee is usually a welcome addition. French fries are practically mandatory. A few weeks ago, I went to Bell Book and Candle with my friend Lyssa, one of their hosts, and had quite the brunch. 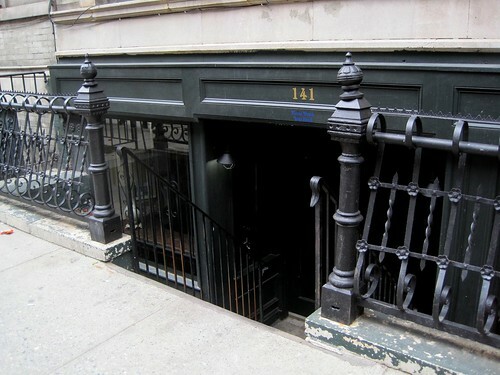 The space, a quietly marked basement on West 10th Street, formerly a laundromat, feels cozy and detached from the rest of the city. 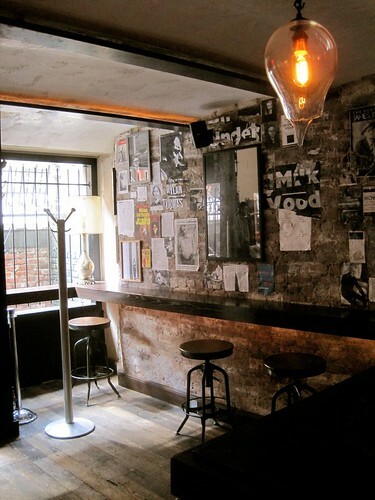 Each of the three main rooms have a different feel, from the spacious bar, to the long grey banquettes in the main room and the plush blue booths before the kitchen. Adding to the seating options, there is a rough-hewn 12-top chef’s table in the kitchen, and a cozy (cramped) 4-person secret room. It was a early on a quiet, grey Sunday, and daylight savings time had just sprung into effect and I had BBC mostly to myself. 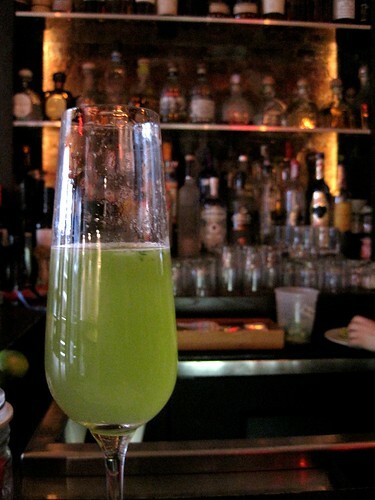 Cat, the brunch bartender, started me off with one of the house specials: The Hanging Basil. It had been a rough Saturday night, so instead of chile-infused vodka, she used kaffir lime-infused Hangar One. 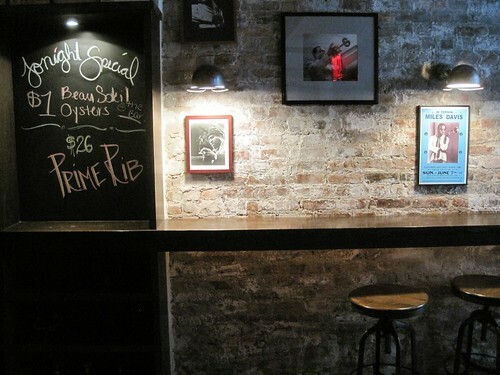 I lingered over the drink while and let myself get completely torn between the lobster taco and a half-dozen $1 Beau Soleil oysters, the crowd-pleaser or a personal favorite. As per usual, oysters won. 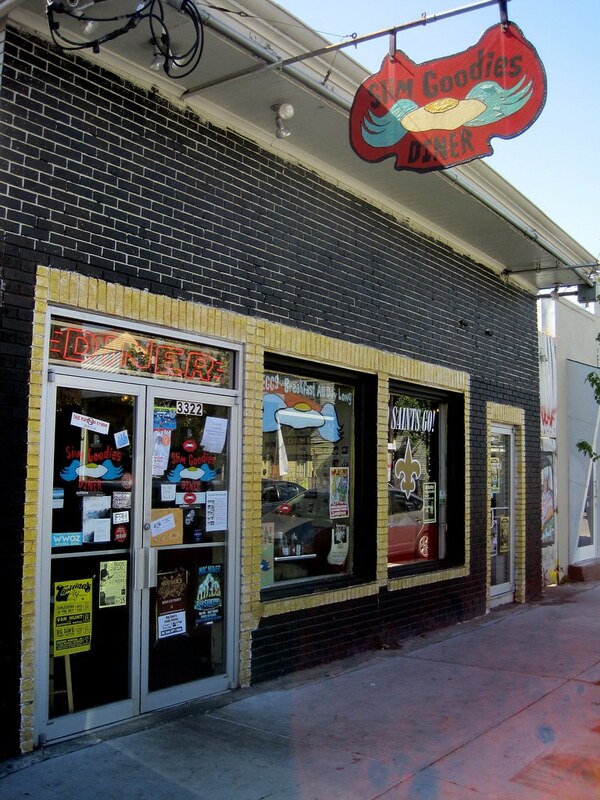 When I go back, I’ll fight the oyster urge and try the taco. No promises, though. I love being near the sea, and oysters taste just like the sea. It was an unexpectedly warm day and after the Hanging Basil was empty and the shells were turned over, I asked Kat for a Pimm’s Cup and she happily obliged, throwing in a few dashes of cherry bitters (from an impressive collection) for good measure. 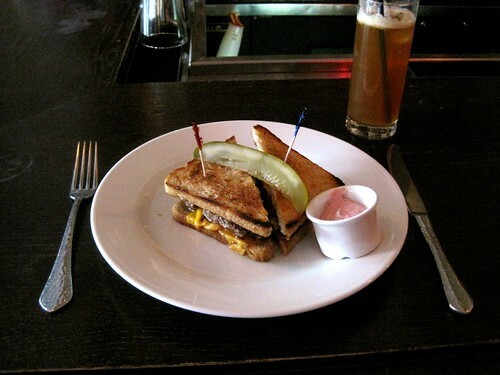 The Patty Melt, medium-rare and beautifully cooked, won out over “gin and tonic” organic salmon. I am a simple guy, I guess, and tend to find salmon unflappably boring. I am a fan of the gin and tonic, but that wasn’t enough. Yawn, though I am sure it would have been well-cooked. 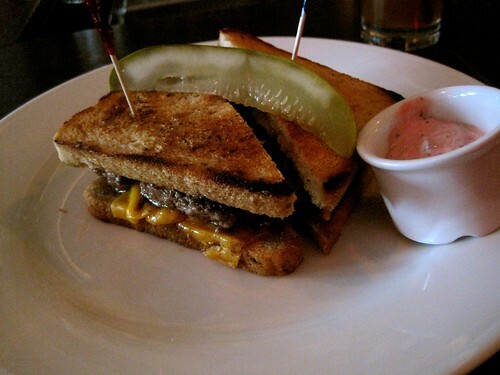 The combination of rich, rare beef and “vintage” cheddar was exactly what my healing body wanted. 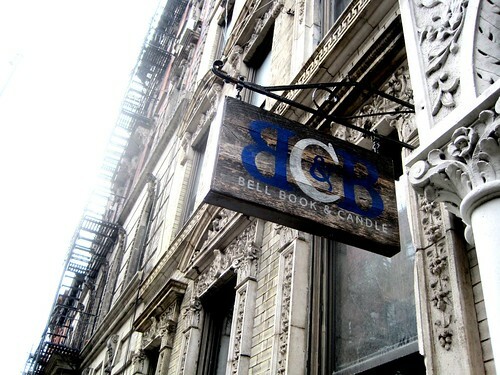 Bell Book and Candle was talked about a bit last fall on Eater, The New York Times, and Grub Street, to name a few. That story at Eater has a great video from ABC Nightline that includes the restaurant’s extensive hydroponic rooftop garden. I can’t wait to go back. Skip produces The Gourmetro. 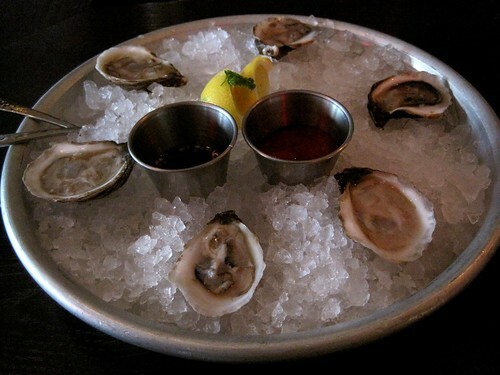 While he finds french fries an essential part of a good brunch, he sometimes substitutes them for raw oysters. Check out his published works on Aisle 9, and talk with him on Twitter. It wasn’t until I turned on the ignition leaving work that I finally decided what to make for dinner last night. I found myself in the somewhat unusual situation of being alone in the house. No blaring television, no loud post-work phone calls, just Grace the Cat and me with bottle of wine. 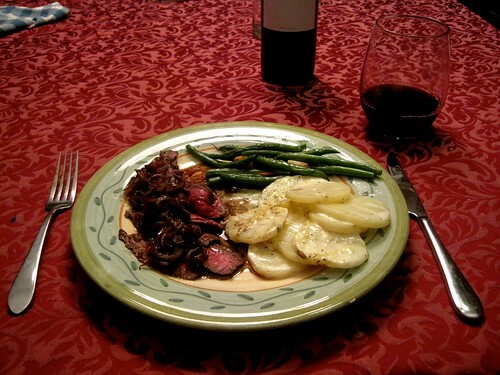 In honor of my good friend Kim Sunee’s birthday, I set out to make one of my favorite bistro meals: hanger steak with shallot sauce, sauteed garlic string beans, and gratin dauphinoise. Simple and elegant are typically what I aim for, and I did not let myself down. On the way home, I stopped at the earthier grocery store and couldn’t find a hanger steak, or even a flank. 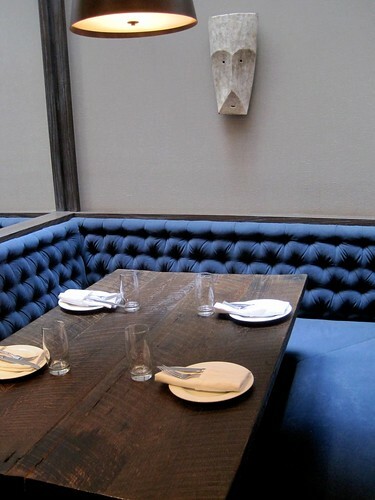 Instead of opting for its tougher sibling, the skirt steak, I went with a flatiron. 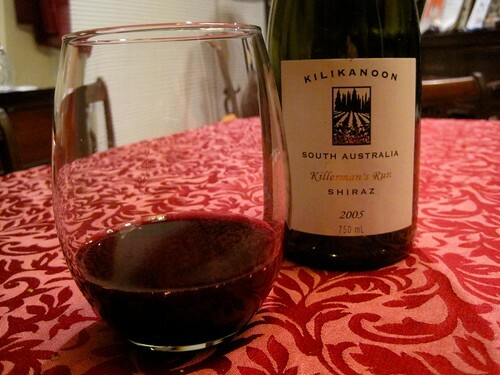 Unpacking the groceries, I poured the last inky, smooth glass of a 2005 Kilikanoon Shiraz. 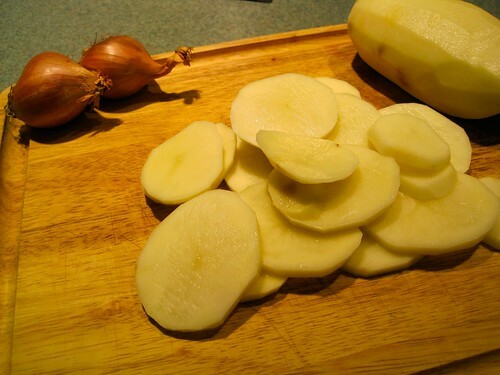 It soothed my nerves while running potatoes through the mandolin, an expedient but moderately terrifying task. 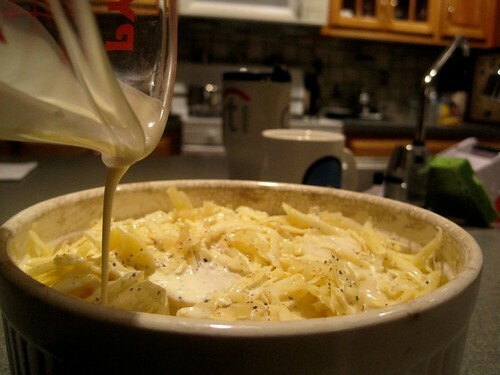 Potatoes are one of the perfect fat delivery vehicles, and gratin dauphinoise is such a deliciously simple dish, consisting of thinly sliced potatoes, salt, pepper, cream and freshly ground nutmeg (I added some gruyere cheese, which is not traditional). 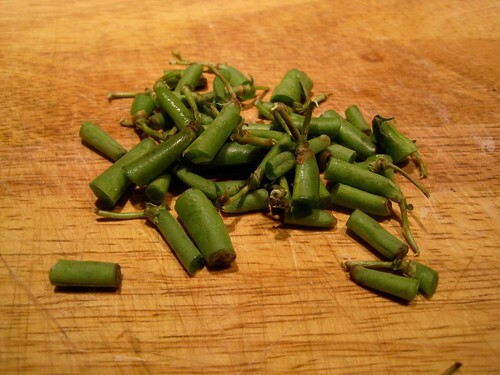 Once in the oven, green beans were prepped, blanched and cooled, and the steak was generously patted down with salt and pepper. With 45 minutes left on the timer I did the dishes and listened to an episode of The Dinner Party Download, which kept me very entertained as I finished the glass of shiraz. 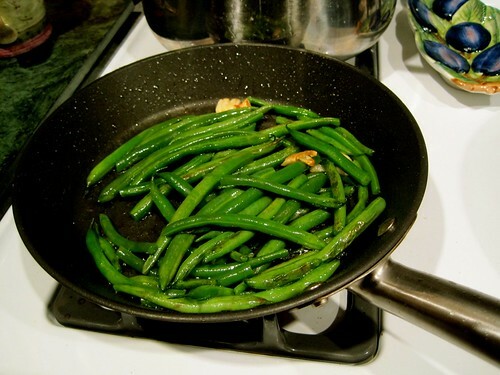 The steak sauteed in canola for about 6 minutes while the garlic and string beans finished up on another burner. The decadent red-wine shallot sauce came together during the steak’s resting period and before long the gratin finished up. Sitting down at the red-clothed table with Grace by my side (she sits at the table on her own stool), I imagined being at a small, loud, crowded cafe in St. Germain-Des-Pres. I only wish I had picked up some oysters, but didn’t linger long on the thought. 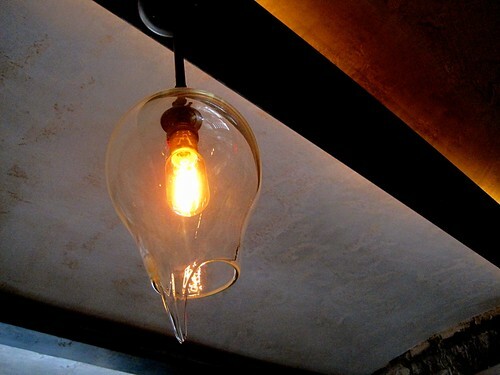 A glass of bright (brash?) Rioja provided a tart companion to the otherwise decadent meal. Skip produces The Gourmetro. His family cat, Grace, eats at the table with him nightly. Aging and no longer content eating pet food, she eats canned tuna fish from her own little plate. Check out his published works on Aisle 9, and talk with him on Twitter.